Those of you who follow me on Twitter or are friends with me on facebook may have seen that last month, I asked for volunteers to come catch and tag sharks with me here in Charleston. While I was pleased by how excited respondents were for this opportunity, I would be remiss if I didn’t acknowledge that involving members of the public in scientific research is an old idea. It’s called Citizen Science. I was first introduced to the concept of Citizen Science by a former teacher, Dr. Julie Reynolds, who uses volunteers to help track invasive plant species in a North Carolina state park. Intrigued by the notion, I looked into the literature on this topic. As it turns out, Citizen Science has a great deal of benefits for both the researcher and the citizen volunteers. Citizen Science greatly increases the number of trained observers participating in a project, allowing observation on a scale otherwise not possible. For example, the Cornell Ornithology lab collects data from more than 200,000 bird watchers throughout the United States and Canada. Citizen Science volunteers have also been used for projects as diverse as tracking coral reef fish populations and seismic monitoring. They were also involved in the first efforts to track the progression of a disease through a wild population (in that case, birds). These important projects would have been impossible without the large number of volunteers involved. Volunteers also benefit. Surveys and interviews indicate that after participating in a Citizen Science project, people report increased feelings of environmental stewardship, increased knowledge about local wildlife, and an increased understanding of the scientific process. Most volunteers also try to educate their friends and neighbors about what they have learned. How do sharks fit into all of this? Actually, shark researchers were some of the first to involve the public in our science. 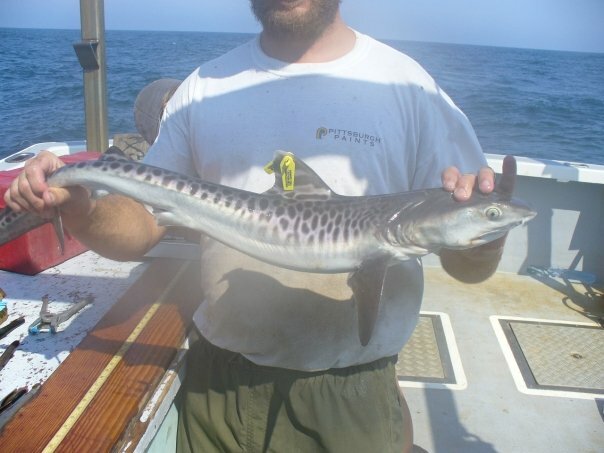 In 1962, the National Marine Fisheries Service Cooperative Shark Tagging Program began (the Cornell bird program began in 1966, making their claim to be the first Citizen Science program not entirely accurate…) The NMFS shark tagging program provides tags and datasheets to volunteers, who catch, tag, collect data from, and release various shark species of interest. If these sharks are later caught by fishermen, the tags have a phone number to call to report the shark’s capture location and size. Tagging large numbers of sharks allows us to track migration routes, growth patterns, and long term population trends. So far, we’ve tagged over 170,000 sharks of 51 species- not quite the number reported by Cornell’s birdwatcher army, but still an impressively high figure. I was pleased to emulate the University of Miami shark survey’s tradition of allowing volunteers from the general public on board, and the results have been largely positive. I received over 200 replies to my call for volunteers. Some were rather frustrating (a gentleman who misunderstood the concept of “volunteering” asked if I could buy him a plane ticket to Charleston from Shanghai, and over 75 people who I have never spoken to before felt the need to e-mail me and say “I’m sorry but I can’t come”. I also received over two dozen resumes of people looking for jobs with the shark survey). Most respondents, however, were people who really wanted to help, and I was able to staff our sampling vessel with volunteers for the whole month of July. Most of our volunteers were incredibly helpful and enthusiastic, and their assistance was invaluable. My fellow shark scientists can attest that it’s really helpful to have an extra person on board to take turns pulling in heavy gear. It’s also helpful to have someone to record data so that the scientist measuring the shark can focus on holding the large angry predator still. Using volunteers instead of field staff also saved the shark survey some money in a year when money is tight everywhere. All of our volunteers learned something about sharks and their important role in our oceans, and at least a few went home and told their friends and family. In what might be the most reliable method of determining how much someone enjoys a task I’ve ever come across, 80% of my former volunteers now use a photo of them holding a shark as their Facebook profile picture. Obviously some projects do not lend themselves to an army of volunteers, such as lab studies that require very specialized training or equipment. Despite this, many field-based projects can be improved by involving volunteers. If it makes any sense for your research project, I cannot recommend the use of Citizen Science volunteers highly enough. You’re right, this is pretty common. Wisconsin uses volunteers for tons of conservation initiatives, including surveying the endangered Butler’s garter snake population, surveying bats and a few other Great Lakes-specific initiatives, like reporting/helping to eliminate our myriad malignant alien species in the lakes.